1. Players start out with a 3 out 2 in set. The inside players should be positioned one at the high post and the other at the block. 2. Once the ball is passed to the wing the high post cuts hard to the short corner. 3. 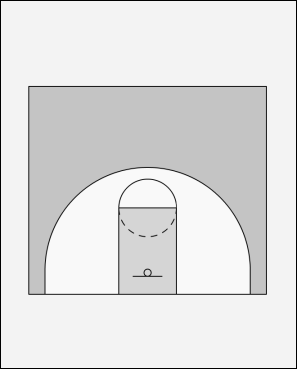 The Opposite post goes to the high post, with the option to set a back screen for a skip if wanted. 1. The best option is to now enter the ball to the short corner. Make sure your short corner man is about 15 feet from the hoop and has his feet to the baseline facing the 3 man. 2. Once the short corner has the ball your five man dives hard to the hoop looking for a pass. 1. If your 5 man does not receive the pass he clears to the opposite block and your opposite guard (2) "Vacumes" into the open spot in the middle of the zone looking to get the ball to score. 1. If number two does not get the ball from the short corner or the wing man he continues to "vacuum" through and go off the screen set by the 5 man. 2. As this is happening the ball is being reversed VERY QUICKLY. The two man will then be open for a baseline jump shot. 3. Once this starts to be open they will begin to slip the screen set by 5, and then you have any easy dump into the post for a layup on the reversal. 4. It then runs as a continuous offense.